Electricity in Serbia is vastly generated by coal based power plants, while the remainder consists by hydro power plants. Electricity losses in transmission grid for 2016 are at 2.15%. Electricity losses in the distribution for 2016 grid are at 12.95% or 3,917 GWh of total distribution demand. Production of crude oil is 34.98%, crude oil imports is 65.3%. Oil products constitute 24.92 % of the total primary energy supply in the country. Source: NREAP progress report 2016. As a signatory of the Energy Community Treaty, Serbia is committed to meet the savings target of 9% or around 752 ktoe, by 2018. 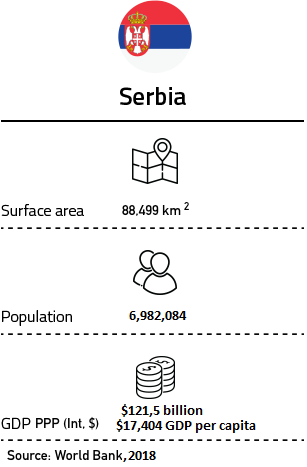 Greenhouse gas emissions in Serbia are around 65,520,880 tons of CO2 equivalent. Serbia has calculated a potential emission reduction of 9.8% in 2030 comparing to 1990 in its INDC.